The 5th Eastern Partnership Summit is an opportunity to promote conflict resolution in the EU’s Eastern neighbourhood. The initiative brings closer together EU citizens and people afflicted by post-Soviet frozen conflicts, and compels Brussels to engage in mediation whilst defending the territorial integrity of its Partners. In Ukraine, the Union faces the challenge of pre–empting the freezing of a conflict. On 24 November, European leaders will meet for the 5th EaP Summit in Brussels to take stock of what has been achieved since the last summit in Riga in 2015 and discuss how to further strengthen cooperation in priority areas. Initiated in 2009, the EaP aims at fostering stability and resilience in six of the EU’s closest neighbours: Armenia, Azerbaijan, Belarus, Georgia, Moldova and Ukraine. This is consistent with the overarching objective of the European Neighbourhood Policy (ENP) to stabilise the Eastern neighbourhood (European Commission, 2017). It is no coincidence, in this regard, that the preparation of the 2017 Summit has included a trip of the EU Political and Security Committee to South Caucasus in early October, as well as the appointment of a new EU Special Representative for the crisis in Georgia on 13 November. Efforts to achieve consolidated stability and resilience in the EU’s Eastern neighbourhood are nevertheless hindered by post–Soviet frozen conflicts afflicting Armenia and Azerbaijan (Nagorno–Karabakh), Georgia (Abkhazia and South–Ossetia), Moldova (Transnistria), and by the war in Eastern Ukraine to a greater extent. Whilst frozen conflicts are synonyms of insecurity and instability, for there is a constant possibility that the conflicts will start again (Jolicoeur, P., & Campana, A., 2009), the war in Donbass remains the most immediate and spectacular security challenge in the region. This article is an attempt to qualify the 2017 EaP Summit as an opportunity to promote conflict resolution in the EU’s Eastern neighbourhood. It proposes to elucidate the extent to which the EaP can be instrumental in contributing to the political settlement of the four frozen conflicts afflicting Partner countries. The Ukrainian conflict is discussed separately as it is not, strictly speaking, frozen. Despite the lack of consensus over the definition of ‘frozen conflict’, it is customary in international relations to consider a conflict to be frozen when active armed confrontation has been brought to an end, but no peace treaty or other political framework resolves the conflict to the satisfaction of the combatants; the conflict can thus legally start again at any moment (Jolicoeur, P., & Campana, A., 2009). In the post–Soviet space, a number of such conflicts arose following the break–up of the Soviet Union in 1991, in areas where the new international borders did not match the ethnic affiliations of local populations. 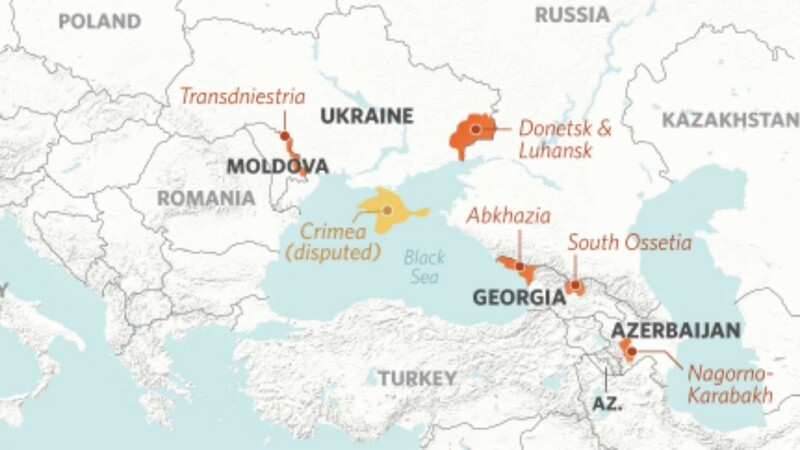 As a result of the non–settlement of these conflicts, certain post–Soviet states are unable to exercise sovereignty on parts of their territories that are controlled by separatists. So is the case in Nagorno–Karabakh, Abkhazia, South–Ossetia and Transnistria. Figure 1. Map of post–Soviet frozen conflicts in the EU’s Eastern neighbourhood. Brussels maintains a firm and consistent policy of supporting the territorial integrity of Partner countries in the Eastern neighbourhood (European Commission, 2017). Changes that have taken place since 1991 in exercising control over the territories highlighted in Figure 1 are not recognised. The EU also supports ongoing dialogues with the aim of reaching peaceful and sustainable solutions. When the Nagorno–Karabakh conflict saw a serious escalation in 2016, the Union called on both sides to respect the ceasefire, tone down rhetoric and engage in substantive talks under the auspices of the OSCE Minsk Group. The EU Special Representative (EUSR) frequently visits the region to support the OSCE’s work. In Georgia, the EU co–chairs the Geneva International Discussions for resolving the conflict and advocates for continued people–to–people contacts throughout Georgia’s entire territory. As an active observer in the 5+2 format for the settlement process of the Transnistrian conflict, including through the EU Border Assistance Mission (EUBAM), Brussels played a key role in the revival of the talks in Berlin in June 2016 and the adoption of a Protocol on the main issues to be solved. The facilitating role of the Union in the region is reinforced by the actions it takes as part of the EaP to bring people closer together. Last year, more than 4 000 students from Partner countries received scholarships in the EU, and almost 10 000 young people took part in exchange programmes. Citizens of Georgia, Moldova and Ukraine now travel without a visa to Schengen countries (Secrieru, S., 2017). Perhaps one of the best examples of Brussels’ positive role is the extension to Transnistria, on 1 January 2016, of the rules of the DCFTA between the Union and Moldova, allowing the economic operators located in this region to continue benefiting from preferential trade with the EU member states. The free–trade deal was inked with Moldova at a time when negotiated trade preferences between the EU and Transnistria were set to expire, leaving the province no choice but to forge a new deal with Brussels that incorporated it into the Moldovan deal (De Waal, T., 2016). As far as hard security is concerned, however, the EaP’s contribution to the defrosting of post–Soviet frozen conflicts is virtually inexistent. The war in Eastern Ukraine remains the hottest armed conflict in Europe. The security situation has slowly but steadily deteriorated despite the sides’ recommitment to the ceasefire in late August, and the OSCE Special Monitoring Mission (SMM) to Ukraine continues to record hundreds of ceasefire violations every day. At humanitarian level, the cost continues to take a heavy toll: at this time last year, the UN Human Rights Office (OHCHR) had already documented 9 640 conflict–related deaths and 22 431 injuries amongst Ukrainian armed forces, civilians, and members of the armed groups. In international relations, it is the only one of the five conflicts at hand to be analysed as a grand geopolitical standoff between Russia and the West (Liik, K., 2015 & Pifer, S., 2017), and the one that causes the most heated diplomatic battle at the UN Security Council. 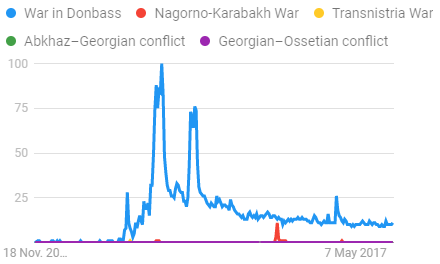 Figure 2 aggregates data from the world’s most popular search engine to show the difference in interest amongst internet users, over the past five years and by regions, for the five conflicts at hand: on–line too, the war in Donbass is the one that draws the most attention worldwide. Figure 2. 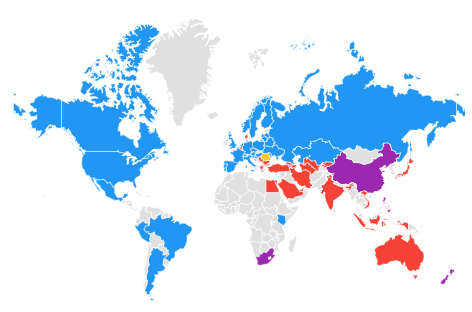 Interest of internet users over time and by region for the five ongoing conflicts afflicting the EaP countries. Notwithstanding the intensity of the Ukrainian conflict, increasing attention is devoted to the risk of a frozen future (Huseynov, R., 2015). Recent developments provide confirmatory evidence that diplomatic efforts in Minsk are laborious, and Ukraine is verging on getting stuck in the Belarusian swamps. Adding to this somewhat flawed negotiating dynamic, there is a showdown between Kyiv and Moscow to table a UN Security Council resolution to deploy peacekeeping forces in Donbass (Bildt, C., 2017). The former proposes an ambitious mission whose logic is analogous to the United Nations Transitional Administration for Eastern Slavonia (UNTAES) and aims at monitoring the demilitarisation and ensuring the peaceful reintegration of the territory of Donestk and Luhansk into Ukraine. The latter proposes a limited peacekeeping operation along the line of contact whose rationale is closer to the United Nations Peacekeeping Force in Cyprus (UNFICYP) and merely entails the protection of the OSCE SMM observers. This Cyprus–style scenario is Russia’s preferred choice insofar it would establish a de facto buffer zone and maintain the military status quo on the ground. Ukraine is not the only post–Soviet state afflicted by a conflict. It is, however, the only ongoing conflict in the EU’s Eastern neighbourhood that is not, strictly speaking, frozen. In many regards, this peculiarity is a challenge for the EU. Although the EaP has proved insufficient to defrost conflicts, it is unsure whether it could pre–empt the freezing of one. At the very least, the EaP can serve as a platform to help fostering stability and resilience in Ukraine at grassroots level by building on past successes. The areas of connectivity and public engagement are instrumental in building stronger relations between EU citizens and Ukrainians. The EaP is a formidable tool for Brussels to engage with the people of Ukraine in areas Moscow has little to offer: people–to–people exchange, empowerment of the youth, support for governance reform and the freedom of the media. All projects that make the EU perceived as a bearer of core values, such as human rights, democracy, the rule of law, civil liberties, economic prosperity, and peace. Although not dealing with hard security, the EaP ought to have a significant impact at diplomatic level too. Ukraine is a Partner country, meaning the Union cannot be a neutral mediator. The facilitating role of the EU is constructive whilst being tainted with strong commitments towards Kyiv, including the unconditional support to the territorial integrity of Ukraine within its internationally recognised borders and the ceaseless condemnation of Russian aggression and illegal annexation of Crimea. This involves monitoring the humanitarian crisis critically and sanctioning Russia accordingly (European Parliament, 2016). The EaP thus creates diplomatic duties that reverberate throughout all international fora wherein EU member states have leverage and can act as constructive, albeit not neutral, facilitators for the settlement of the war in Eastern Ukraine. Worthy of consideration are, in this respect, the political clout of France and Germany in the Normandy format and the collective weight of EU member states in the OSCE – 28 out of 57 participating states. Lastly, France and the United Kingdom are soon to be joined in the UN Security Council by Poland and Sweden, the two countries who initiated the EaP eight years ago (Wallstroem, M., & Waszczykowski, W., 2017). Post-Soviet frozen conflicts are diplomatic conundrums as well as disquieting sources of insecurity. It is therefore in the EU’s best interest to pre–empt the freezing of the war in Donbass, whilst continuing to facilitate the peaceful settlement of the conflict. There is empirical evidence that the EaP could be instrumental to this end, insofar it can help building stability and resilience in Ukraine. European leaders would be well-advised to take account of past successes when they meet on 24 November, and seize the opportunity to promote conflict resolution in the Eastern neighbourhood. Bildt, C., 2017. Is peace in Donbas Possible?. ECFR, 12 October. De Waal, T., 2016. An Eastern European Frozen Conflict the EU Got Right. Carnegie Europe, 16 February. European Commission, 2017. Report on the Implementation of the European Neighbourhood Policy Review. European Parliament, 2016. The frozen conflicts of the EU’s Eastern neighbourhood and their impact on the respect of human rights. Huseynov, R., 2015. Ukraine: Towards a frozen future?. The Politicon, 11 November. Jolicoeur, P., & Campana, A., 2009. « Conflits gelés » de l’ex–URSS: Débats théoriques et politiques. Études internationales, 40(4), 501–521, doi:10.7202/038929ar. Liik, K., 2015. The diplomatic battle for Ukraine. ECFR, 27 April. Pifer, S., 2017. How Ukraine views Russia and the West. Brookings Institution, 18 October. Secrieru, S., 2017. The visa-free 3D effect: Georgia, Moldova and Ukraine. European Union Institute for Security Studies, Brief 28, doi:10.2815/87742. Wallstroem, M., & Waszczykowski, W., 2017. EU’s eastern partnership needs revival. EUobserver, 14 November.